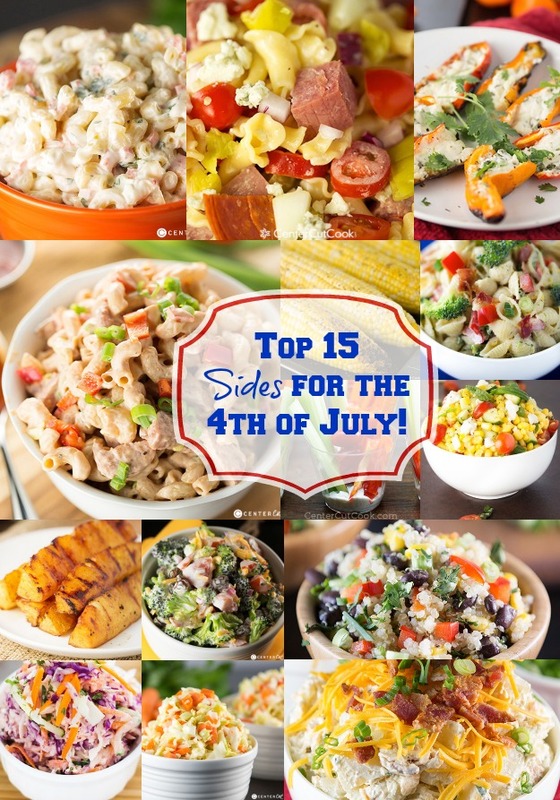 The top 15 side dish recipes for your 4th of July party! With the 4th of July right around the corner, I thought I’d share some of the best side dishes to serve alongside all of your favorites like Grilled BBQ Ribs or juicy burgers! Whatever you decide to make for your main dish, these awesome sides are sure to be a hit and include everything from pasta salads (our favorite pasta salads are also here), cole slaw including my KFC copycat recipe, potato salads and more! BBQ Macaroni Salad – BBQ Macaroni Salad is similar to traditional macaroni salad except the dressing combines mayo with tangy BBQ sauce. The addition of turkey kielbasa makes this a hearty pasta salad perfect summer BBQ’s, potlucks, and to accompany weeknight dinners. KFC Coleslaw Copycat – A KFC Coleslaw Copycat recipe! The dressing tastes almost identical to the original thanks to one key ingredient. You will be pelasantly surprised at how much this clone tastes like the original KFC Coleslaw. Easy Macaroni Salad – Easy Macaroni Salad, just like you’d get from the deli at the grocery store! This basic version of Classic Macaroni Salad can be modified to be made with tuna, peas, or whatever add-ins you’s like! Broccoli Salad – Fresh Broccoli Salad recipe with bacon and cheddar cheese! This Broccoli Salad is a classic summer side and comes together in minutes! It is perfect for summer BBQs and potlucks, or any night of the week. Southwest Quinoa Salad – Southwest Quinoa Salad similar to the Whole Foods version with a lime dressing! Clean eating never tasted so good! How to Grill Corn On the Cob – Grilled corn is one of the best things about summer! This easy recipe will guide you through how to perfectly grill corn! Grilled Pineapple – Brown sugar and cinnamon coat spears of pineapple which get grilled to perfection. One of my absolute favorite recipes for grilling season! Antipasto Pasta Salad – The Classic Italian Antipasta pasta platter is turned into a perfect pasta salad with chunks of pepperoni, pepperoncini peppers, tomatoes, cucumbers, and blue cheese crumbles! Fresh Corn Salad – Fresh corn salad is easy to make, light, healthy, and delicious, and promises to be a summer favorite! Grilled Stuffed Mini Bell Peppers – Light grilled stuffed (vegetarian) mini bell peppers work perfectly as a side dish, or as an appetizer! Stuffed with cream cheese, a little sour cream, cilantro and lime, these stuffed bell peppers are flavorful and delicious! Spicy Cole Slaw – Restaurant style Spicy Cole Slaw packs a bit of heat, but not too much! Perfect for summer BBQ’s! Roasted Potato Salad – Tender roasted red potatoes, crisp bacon, and bright green scallions get tossed together to create this delicious Roasted Potato Salad! Easy Ranch Pasta Salad – Easy Ranch Pasta Salad with bacon, broccoli, and red pepper! Veggie Cups with Ranch Dip – Sometimes it’s not about what you make, it’s about how you present it! These Veggie Cups will be a hit at your next party.